Fuzz Club, organised by the label of the same name in partnership with Eindhoven Psych Lab, in that city’s imperious Effenaar venue, is ostensibly a ‘psych fest’. It’s a little steelier than most, perhaps – there is more psychedelia of the skull-crushing, motoric and guitar-based variety than there are whacked-out interdimensional synth voyages – but psychedelia it remains. In the wider world, psych is somewhat on the wane in 2018, having hit a soaring high four or five years ago. In Liverpool, the annual International Festival of Psychedelia – one of Europe’s largest – was the undisputed daddy of the Scouse music calendar, a cosmic celebration imbued with a sense of starry-eyed optimism, a friendliness and community spirit. After last year’s Fuzz Club Eindhoven, and before our ears had even stopped ringing, The Fuzz Club promoters began working on round two. Today we’re unbelievably excited to share the first seventeen bands who are set to play at FCE19 – taking place once again at the Effenaar over August 23rd-24th. You can find the line-up as it stands as well as a link to early-bird tickets below. So, topping the bill will be everyone’s favourite Japanese mavericks Kikagaku Moyo, who will be bringing their transcendental blend of minimalist psychedelia, Eastern folk and krautrock. Also joining them will be Iceage and their twisted post-punk drawl and The Soft Moon, whose pounding cocktail of industrial, EBM and darkwave will be shaking floors in the early hours. On top that there will be The KVB’s icy synth-pop, the shadowy drone-rock of Tess Parks and shoegazing legends The Warlocks and The Telescopes. Plus further Japanese hypnosis courtesy of Minami Deutsch, synth-punk workouts from Rendez-Vous and droning garage-psych from Alan Vega proteges The Vacant Lots. Oakland cosmonauts Lumerians, Chilean heavyweights Vuelveteloca and South African noise-pop duo Medicine Boy. We’ll also be bringing back Berlin post-punk outfit The Underground Youth and Porto krautrockers 10 000 Russos. Kikagaku Moyo, The Soft Moon, Iceage, The KVB, Tess Parks, The Underground Youth, The Warlocks, The Telescopes, The Vacant Lots, Lumerians , Whispering Sons, Rendez-Vous, Iguana Death Cult, Minami Deutsch, 10 000 Russos, Medicine Boy en Vuelveteloca. Kikagaku Moyo. are a psychedelic project of the highest order, Masana Temples is released on Amsterdam’s Guruguru Brain label and represents the most complete collection of the journey that the five-piece band has been on since their first release in 2013. As the group begins to scatter around the world, their music represents the spiritual results of these treks through ruminations led by standout guitar, sitar and drum work. Look no further than lead single “Gatherings” for a representation of the mind-boggling, transcendental music that this band is creating. 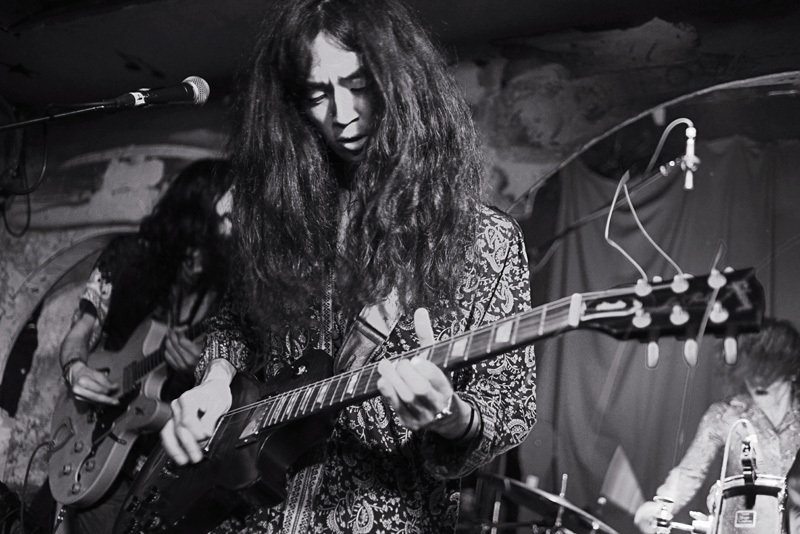 Kikagaku Moyo started in the summer of 2012 busking on the streets of Tokyo. Though the band started as a free music collective, it quickly evolved into a tight group of multi-­instrumentalists. Kikagaku Moyo call their sound psychedelic because it encompasses a broad spectrum of influence. Their music incorporates elements of classical Indian music, Krautrock, Traditional Folk, and 70s Rock. Most importantly their music is about freedom of the mind and body and building a bridge between the supernatural and the present. Improvisation is a key element to their sound. The shifting dimensions of Masana Temples, fourth album from psychedelic explorers Kikagaku Moyo, are informed by various experiences the band had with traveling through life together, ranging from the months spent on tour to making a pilgrimage to Lisbon to record the album with jazz musician Bruno Pernadas. The band sought out Pernadas both out of admiration for his music and in an intentional move to work with a producer who came from a wildly different background. With Masana Temples, the band wanted to challenge their own concepts of what psychedelic music could be. 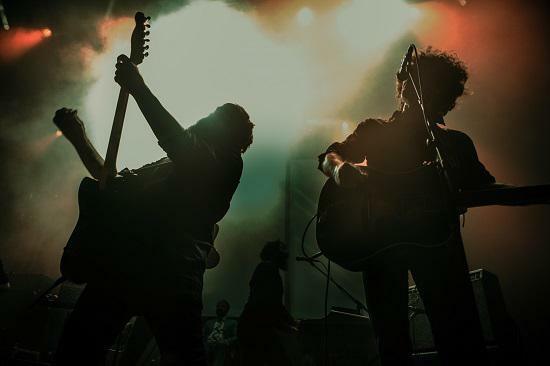 Elements of both the attentive folk and wild-­eyed rocking sides of the band are still intact throughout, but they’re sharper and more defined. More than the literal interpretation of being on a journey, the album’s always changing sonic panorama reflects the spiritual connection of the band moving through this all together. Life for a traveling band is a series of constant metamorphoses, with languages, cultures, climates and vibes changing with each new town. The only constant for Kikagaku Moyo throughout their travels were the five band members always together moving through it all, but each of them taking everything in from very different perspectives. Inspecting the harmonies and disparities between these perspectives, the group reflects the emotional impact of their nomadic paths. The music is the product of time spent in motion and all of the bending mindsets that come with it. The shifting dimensions of Masana Temples, is the fourth album from psychedelic explorers Kikagaku Moyo,are informed by various experiences the band had with traveling through life together, ranging from the months spent on tour to making a pilgrimage to Lisbon to record the album with jazz musician Bruno Pernadas. The band sought out Pernadas both out of admiration for his music and in an intentional move to work with a producer who came from a wildly different background. with Masana Temples, the band wanted to challenge their own concepts of what psychedelic music could be. elements of both the attentive folk and wild-¬‐eyed rocking sides of the band are still intact throughout, but they’re sharper and more defined. more than the literal interpretation of being on a journey, the album’s always changing sonic panorama reflects the spiritual connection of the band moving through this all together. life for a traveling band is a series of constant metamorphoses, with languages, cultures, climates and vibes changing with each new town. the only constant for Kikagaku moyo throughout their travels were the five band members always together moving through it all, but each of them taking everything in from very different perspectives. inspecting the harmonies and disparities between these perspectives, the group reflects the emotional impact of their nomadic paths. the music is the product of time spent in motion and all of the bending mindsets that come with it. Kikagaku Moyo is the musical union between five free spirits. Go Kurosawa (drums, Vocals) and Tomo Katsurada (Guitar, Vocals) formed the band in 2012 as a free artist’s collective. They met Kotsuguy (Bass) while he was recording noise from vending machines and Akira (Guitar) through their university. Ryu Kurosawa had been studying Sitar in India, upon returning home he found the perfect outlet for his practice. Following last year’s album House In The Tall Grass, Tokyo’s Kikagaku Moyo have announced plans for a new EP alongside summer European live dates. Stone Garden has been released on vinyl and digital on April 21st via the record label the band run, Guruguru Brain. Stone Garden, we’re told, started in a basement studio in Prague with a nearly continuous session over several days and nights. The original concept was ‘influenced by the raw and seemingly endless jams of psychedelic pioneers’. The freeform songs that emerged from these sessions were refined over several months at the band’s home in Tokyo, where each song was sculpted into an uncommon form. 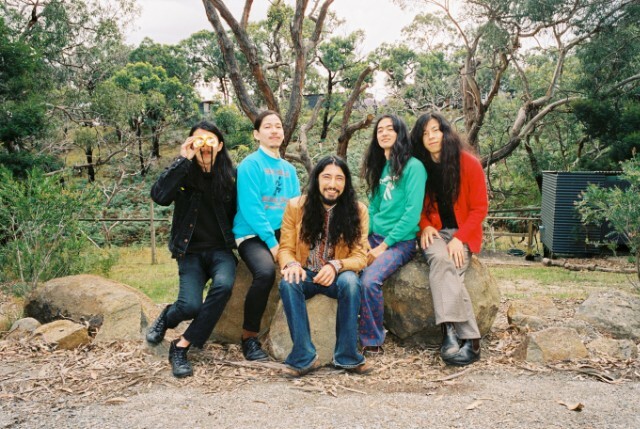 The band run their own record label, Guruguru Brain, focusing on releasing underground artists from Asia, including Kikagaku Moyo. Last year they curated a stage at Liverpool International Festival of Psychedelia, and they will return to the UK this Summer for a headline tour (dates below). The EP “Stone Garden” will be released on Vinyl & Digital in April 21st 2017. To anyone who has heard the music of Kikagaku Moyo, it should come as no surprise that the band’s origins lie in hours upon hours of late-night jamming, illuminated by nothing more than the geometric patterns playing behind the band’s eyelids, resulting in a natural, free-floating sound, as of-the-earth as it is intergalactic. It may be surprising that the band sharpened their improvisational skills by busking on the streets of their native Tokyo. It may be surprising that the band’s overall sound may owe as much or more to the Incredible String Band as it does to Acid Mother’s Temple. But what’s perhaps most surprising about Forest of Lost Children, the band’s face-melting, recorded-ritual sophomore album, is how utterly centered and mature the band sounds, especially given their relatively short lifespan as a band. Boundless though they may be, Kikagaku Moyo here sound anything but lost, their child-like wonder manifested in a confident, courageous exploration of sound. Labels – psychedelic, folk, prog-rock, psychedelic-folk-mixed-with-prog-rock – do little to accurately reflect the spectrum of influences on display, let alone the more impactful realization of completeness in Kikagaku Moyo’s songs. 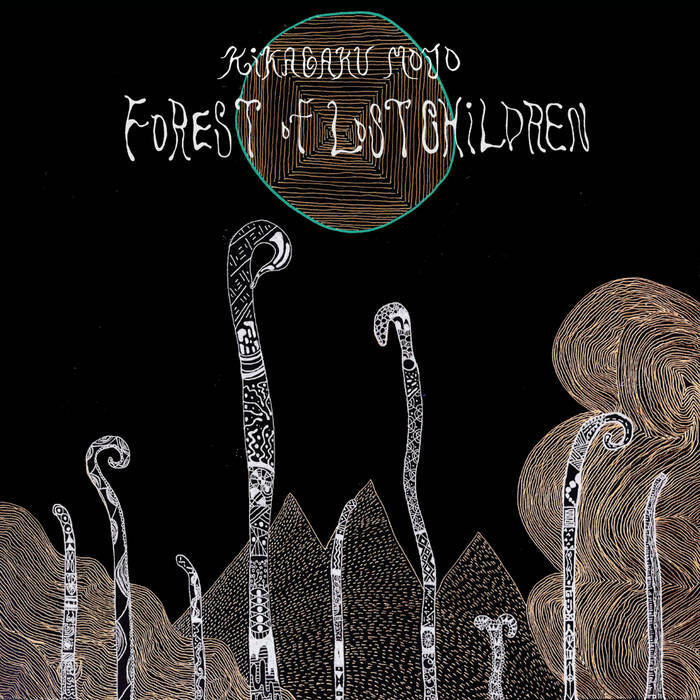 Easily one of the most shimmering crown-jewels in the rapidly expanding BBiB catalog, look for Kikagaku Moyo and Forest of Lost Children to be found taking shape in the expanded minds of listeners everywhere. Just in time for Kikagaku Moyo’s 2017 US and EU tours in May and June respectively, we’ve got a beautiful fresh pressing in the works with a brand-new Bone & Black A-side/B-side “swirl” variant. And the cover art for this fourth pressing of FoLC will be printed on heavy duty reverse-board jackets. The band will have a few of these on tour, but likely to sell out. These will ship May 2017. House in the Tall Grass by Japanese psych-folk outfit Kikagaku Moyo could be seen as initially disappointing, for this release reins in the band’s experimental and challenging tendencies, replacing it with what could, at face value be perceived as a more straightforward down-the-middle psych rock album. Yet, like all the best records, it’s slow to reveal its charms. It teases us before unveiling its delicate and fragile beauty that is as enchanting as it is beguiling. With heavy use of sitars – albeit in a subtle, non-clichéd manner – this is a record that is preoccupied with the gentle, exploring the edges of human emotions through delicate slow-building tracks that grow and envelope almost imperceptibly. Laced with an eloquent sadness and wistful longing, it revels in a lush quiet undercharged beauty that reminds that slow and suggestive can be as overwhelming as loud and heavy. Kikagaku Moyo will not disappoint you. With this new release, the band continues offering to their followers their trademark psychedelic sound. If you don’t know them, now it’s the time to rectify that mistake.